At the College of Business, students receive hands-on experience through internships and other campus resources, like iLabs and the Bloomberg Finance Lab. Offering innovative programs to help students thrive in a competitive market. The College of Business has the faculty, staff, and facilities to put our students in a position to succeed. The College of Business community includes more than 1,250 undergraduate and 450 graduate students from 20 states and 12 countries. Students work with excellent faculty to develop the skills that will enable them to succeed and have an important impact on the state of Michigan and beyond. Provost Kate Davy and Chancellor Domenico Grasso (center) congratulate recipients of the 2019 Faculty Awards. From left: Vivek Singh, Distinguished Research Award; Bochen Jia, Distinguished Teaching Award; Jeffrey R. Bouwman, Distinguished Digital Education Award; Gerald Holowicki, Collegiate Lecturer Program Award; Nilay Chakraborty, Distinguished Teaching Award; Edward J. Williams, Collegiate Lecturer Program Award; and H. James Gilmore, Distinguished Service Award. 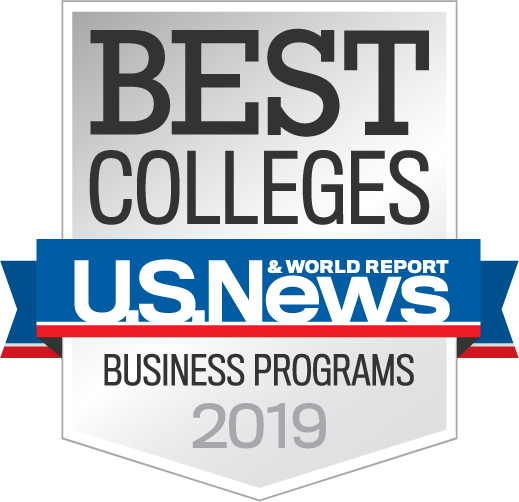 The College of Business is accredited by the Association to Advance Collegiate Schools of Business-International (AACSB). Only about 25% of Business schools in the U.S. and less than 5% of over 16,000 Business schools worldwide have earned AACSB accreditation.